Translated fiction has largely been under-theorized, if not altogether ignored, in literary studies. Though widely consumed, translated novels are still considered secondary versions of foreign masterpieces. 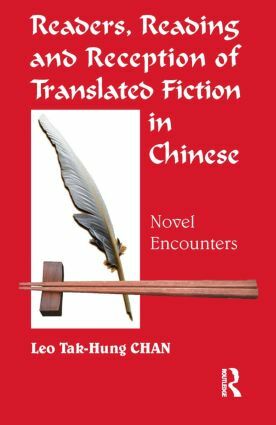 Readers, Reading and Reception of Translated Fiction in Chinese recognizes that translated novels are distinct from non-translated novels, just as they are distinct from the originals from which they are derived, but they are neither secondary nor inferior. They provide different models of reality; they are split apart by two languages, two cultures and two literary systems; and they are characterized by cultural hybridity, double voicing and multiple intertextualities. With the continued popularity of translated fiction, questions related to its reading and reception take on increasing significance. Chan draws on insights from textual and narratological studies to unravel the processes through which readers interact with translated fiction. Moving from individual readings to collective reception, he considers how lay Chinese readers, as a community, 'received' translated British fiction at specific historical moments during the late twentieth and early twenty-first centuries. Case studies discussed include translations of stream-of-consciousness novels, fantasy fiction and postmodern works. In addition to lay readers, two further kinds of reader with bilingual facility are examined: the way critics and historians approach translated fiction is investigated from structuralist and poststrcuturalist perspectives. A range of novels by well-known British authors constitute the core of the study, including novels by Oscar Wilde, James Joyce, D.H. Lawrence, Virginia Woolf, John Fowles, Helen Fielding and J.K. Rowling.